Appearance: Color is a beautiful amber-red. Very clear. Head was big and puffy and receded to a fine lacing. Smell: Floral aromas from the hops along with a nice mix of malts and dark fruits. Some graininess in the finish. Initial Taste: A malty sweetness covers the mouth and is beautifully balanced with a hop bitterness. Very slight coffee/smokiness from the roasted barley. Finish is little bitter and very clean. Very smooth beer. Thoughts: The Smithwick’s company began over 300 years ago. They boast the title of THE Irish Red Ale. Being the longest established brewer and the oldest working brewery in Ireland it’s easy to see why this beer is so popular. This is some of the best of the big industrial beers. Sure the recipe has changed since the big Guinness buyout but the beer remains at the top of the Irish red ales. While this beer won’t blow you away with flavor as other craft Irish reds do it does deliver as a refreshingly smooth session beer. I recommend. PS. Mix this and Guinness to create a traditional Irish Black & Tan. 50/50 Guiness & Smithwicks. Personally I wasn’t thrilled with this beer. Granted I haven’t many Irish Reds under my belt to compare it with, but I found the Smithwick’s to be uninspiring. Not bad, but not something I’d seek out either. Just try some, you’ll know what we mean. I consider myself somewhat of an expert on ale and this is the stuff of legends. never know real beer, the poor lads. In my opinion, the most balanced, perfect mass-produced beer made. I keep coming back to it. 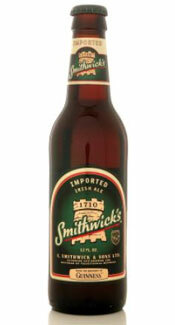 Smithwicks is the best red ale ever brewed. Praise the lord if you’re lucky enough to live near a pub that serves it on tap. ‘Tis pure heaven lads. I love this beer I live in Fort Lauderdale and I can’t find it for sale anywhere I have looked. It’s a shame ! !